Oloid structure. Showing the two 240 degrees circular sectors and the convex hull. An oloid is a three-dimensional curved geometric object that was discovered by Paul Schatz in 1929. It is the convex hull of a skeletal frame made by placing two linked congruent circles in perpendicular planes, so that the center of each circle lies on the edge of the other circle. The distance between the circle centers equals the radius of the circles. 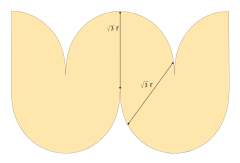 One third of each circle's perimeter lies inside the convex hull, so the same shape may be also formed as the convex hull of the two remaining circular arcs each spanning an angle of 4π/3. Where r is the oloid's circular arcs radius. Since this difference is fairly small, the oloid's rolling motion is relatively smooth. 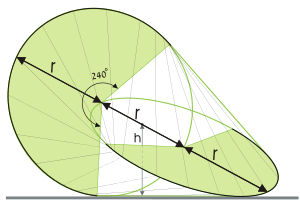 The sphericon is the convex hull of two semicircles on perpendicular planes, with centers at a single point. Its surface consists of the pieces of four cones. It resembles the oloid in shape and, like it, is a developable surface that can be developed by rolling. However, its equator is a square with four sharp corners, unlike the oloid which does not have sharp corners. Another object called the two circle roller is defined from two perpendicular circles for which the distance between their centers is √2 times their radius, farther apart than the oloid. It can either be formed (like the oloid) as the convex hull of the circles, or by using only the two disks bounded by the two circles. Unlike the oloid its center of gravity stays at a constant distance from the floor, so it rolls more smoothly than the oloid. ^ a b c d Dirnböck, Hans; Stachel, Hellmuth (1997), "The development of the oloid" (PDF), Journal for Geometry and Graphics, 1 (2): 105–118, MR 1622664 . ^ Sloane, N. J. A. (ed.). "Sequence A215447". The On-Line Encyclopedia of Integer Sequences. OEIS Foundation. ^ Kuleshov, Alexander S.; Hubbard, Mont; Peterson, Dale L.; Gede, Gilbert (2011), "Motion of the Oloid-toy", Proc. 7th European Nonlinear Dynamics Conference, 24–29 July 2011, Rome, Italy (PDF) . Wikimedia Commons has media related to Oloid surface. Rolling oloid, filmed at Swiss Science Center Technorama, Winterthur, Switzerland. Oloid mesh Polygon mesh of the oloid, and code to generate it. This page was last edited on 12 August 2018, at 17:54 (UTC).